Moist and full of fresh strawberry flavor, these muffins make a delightful treat. They’re perfect for a healthy breakfast, snack, or dessert, and the kids will love them! Strawberries are on the Maybe list of foods to eat. They are one of the lowest-sugar fruits that you can find and, along with other berries like blueberries, are a good way to introduce some fruit into your diet. Add in the coconut milk, coconut oil, and coconut flour, and you have a fiber-rich, low-sugar snack that all the family will love. All the coconut ingredients have another benefit too. They all have antifungal properties, meaning that they can help to slow or prevent a yeast overgrowth in your gut. Ingredients like this can improve your long-term gut health. 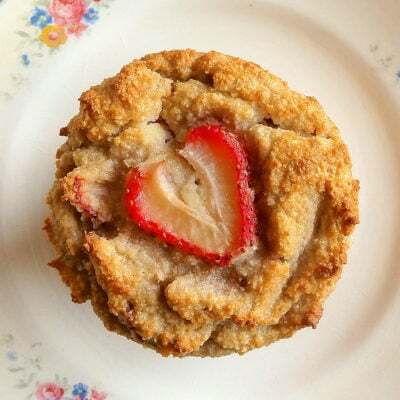 You can make a large batch of these strawberry muffins and freeze them for eating later. Take them on a picnic, or just keep them in the house for those between-meal hunger pangs. Just remember to make enough! Moist and full of fresh strawberry flavor, these muffins make a delightful treat, perfect for breakfast, a snack or dessert. Preheat oven to 350 degrees F (175 degrees C). Line 6 cups of a 12 cup muffin tin with paper baking cups or brush generously with oil, set aside. In a medium bowl, sift coconut flour, baking soda and salt, whisk to combine. In another medium bowl, add unsweetened coconut milk, stevia, melted coconut oil, eggs, and vanilla, whisk thoroughly. Pour liquid ingredients into bowl with dry ingredients, stir to combine for one minute as coconut flour absorbs liquids. Fold diced strawberries into muffin batter. Spoon muffin batter into the prepared tin, smoothing tops, then press a strawberry slice on the top of each. Bake muffins until golden brown, about 30 to 35 minutes. Cool, serve. Nutritious, tasty snacks like this are what the Candida diet is all about. If you’re looking for more ideas, check out our Ultimate Candida Diet program. It includes more than 100 tasty recipes for every meal and every stage of the Candida diet. 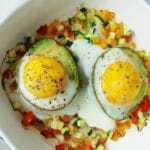 Do you think flax eggs would work in this recipe. On top of Candida I was recently diagnosed with an egg allergy. When can I start to add strawberries into my diet again? After a month, 2-3 months? I’ve tried a lot of your recipes and they’re very helpful! It really depends on the rest of your diet. If you are avoiding most fruits and all added sugars already, then a few strawberries should be just fine. 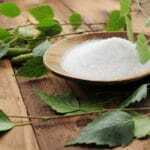 Is the stevia really necessary? Would they be sweet enough without it? It depends what you’re used to. Personally, I would be comfortable leaving out the stevia. However, if you’re used to sweet-tasting muffins then you might need it. Is the whole batch 167 calories in total or is it per muffin? Thanks! Lisa what vanilla extract do you recommend? I’m from the uk. I’m trying find extract that has no sugar or alcohol in it. The only one I can find has Vegetable Glycerine in it. It Calle Vanilla NuStevia Alcohol Free. Would need avoid vegetable Glycerine? Vegetable glycerin is pretty low in sugar and won’t affect your blood glucose too much. However, make sure that you don’t consume too much of it and that ideally it’s paired with a protein. Also remember that your overall sugar intake should be fairly limited. Great recipe! I changed out the coconut milk for unsweetened almond milk, added an extra egg, 1/2 tsp cinnamon, and subbed in blueberries instead of strawberries. Turned out great! 🙂 A bit mealy, but baking with coconut flour always lends to a different texture. Thank u for showing me the substitute for the canned coconut milk which I was out of !! This was great! I followed the recipe exactly (but doubled it) and it’s a great treat to have when you’re avoiding sweets. Would definitely recommend doubling (6 muffins is never enough!) but I’ll for sure be making this again. Thanks! I double the quantities and put 1/3cup coconut flour and 2/3cup almond meal. The texture was perfect! Very gnammy! These were so amazingly yummy, and my husband even made them who never bakes! !